The tradition of performing a Greek play in Cambridge goes back to 1882, when the very first production was of Sophocles’ tragedy Ajax. The two producers were not classicists in the strict sense: the first was John Willis Clark, superintendent of the Museum of Zoology who possessed a passionate interest in the theatre. The other was Charles Waldstein, a classical archaeologist. From the first, the plays were intended to be effective drama as well as accurate reconstructions of the ancient Greek productions. The producers were inspired by the opportunity to stage the plays rather than to read them as texts, and to make a wider audience aware of the particular strengths of Greek tragedy and comedy. “Directness and vitality” was the ideal, according to Waldstein. Even in the nineteenth century it was accepted that most of the audience were not sufficiently fluent in Greek to follow the play, and a printed English translation was provided. Ajax was a triumph and was followed by Aristophanes’ comedy Birds in the following year. The plays flourished during the nineteenth century amid the contemporary passion for all things classical, but their continuing success during the twentieth century depended on the ability of the producers to move with the times and incorporate new theatrical developments into the plays. That their success was indeed sustained was in part due to the combination of undergraduate ability with more established talent. The artist Gwen Raverat was invited to illustrate the programme for Aeschylus’ Oresteia in 1933, creating some striking woodcut designs. Music for the plays was contributed by a wide range of composers including Hubert Parry (Birds, 1883), Ralph Vaughan Williams (Wasps, 1909) and Dennis Arundell (Sophocles’ Electra, 1927). Undergraduate talent should not be dismissed. Some undergraduates who took part in the play later made theatre their career: for example James Mason on film and John Barton on stage for the Royal Shakespeare Company; more recently Tom Hiddleston (Orestes in Sophocles’ Electra, 2001) has gone on to a stellar career on stage and screen. By the 1960s professional directors were recruited, opening up a new range of dramatic possibilities and technical resources. Later productions included actors in modern dress and a new interest in political relevance. In 1998, for example, Jane Montgomery set the last Greek play of the twentieth century, Euripides’ Trojan Women, in the former Yugoslavia during the aftermath of the war. The 2007 production of Euripides’ Medea was set in a tranquil Edwardian garden (right), but director Annie Castledine used historical parallels with the suffragette movement to explore the bloody impact of Medea’s suffering and revenge. In 1890 the Daily Chronicle had announced that “Greek plays are a fashion not likely to last”, yet interest in Greek tragedy still shows no sign of fading. By 2004, when Annie Castledine directed Oedipus Tyrannus in Cambridge, Vanessa Redgrave was playing Hecuba for the RSC, Claire Higgins playing the same role at the Donmar Warehouse, and Katie Mitchell staged Euripides’ Iphigenia at Aulis at the National Theatre. The Cambridge Greek play has a long historical tradition, but it is still a fertile ground for generating new dramatic experiences. Plays in the original tongue were quite often performed in academic circles in the days of Shakespeare, but the Puritans put a stop to all that. Then, early in the 1880’s, there was a remarkable efflorescence, with Frank Benson’s Agamemnon at Oxford in 1880, an Oedipus Tyrannus at Harvard in 1881 and an Alcestis at Bradfield College early in 1882. Meanwhile there arrived at Cambridge in 1880, to be the first lecturer in classical archaeology, a young graduate of Columbia and Heidelberg, Charles Waldstein. When he was dining one evening in 1882 at the house of John Willis Clark, Registrary (and architectural historian) of the University, the talk turned to the Oxford Agamemnon to such effect that in November of that year the first Cambridge Greek Play was staged. The Ajax of Sophocles was chosen, partly perhaps because it had only one female character (A. R. Macklin of Caius was a great success as Tecmessa). The other great success was J. K. Stephen as Ajax. ‘Subject to the divine frenzy, there is madness in his distorted face and rolling eye’, said the Daily News. People remembered it poignantly when, a few years later, this cousin of Virginia Woolf did indeed go mad. The theatre mentioned was a barn-like structure, which stood between Emmanuel College and the University Arms. For the Ajax it was still called St. Andrew’s Hall, but before the Birds flew in, it had renamed itself Theatre Royal. It had the advantage of seating nearly 2000, and though its stage was very cramped, it admitted of a lower stage in front of the chorus. By 1897, this had been pulled down and replaced by the New Theatre, with gallery and dress circle. Here the Greek plays were produced until 1936, when it had become a cinema, and they were transferred to Keynes’ brainchild, the new Arts Theatre. Samples of attendance may be given: 2704 in 1883; 3519 in 1897; 5056 in 1903. Since 1936 they have settled down at about 4000. In 1936, so many applicants were disappointed that an extra matinée of the Frogs was staged on the first day of the Easter Vacation at the vast Chiswick Empire. In the Ajax the most loudly applauded line had been: Woman, in women silence is a grace. Nevertheless in the Eumenides of 1885, the part of Athena was played by a woman, Miss J.E. Case, who had made her mark as Electra in an enterprising production of Sophocles’ play a the new Girton College in November 1883. Yet despite her acclaimed success no woman featured again until 1950 when Heather Brown (later Baroness Brigstocke) was Antigone in the Oedipus at Colonus. The Greek Play followed with tradition and men played female characters. R. Geikie of King’s as Iphigenia in 1894 succeeded in reminding the Cambridge Review’s critic of Eleanora Duse, while the Granta’s averred that ‘her eyes flashed quite like Sarah Bernhardt’s, though at other moments she looked more like Mrs. Patrick Campbell’. George Rylands’ photograph in the Daily Mirror as Electra in the 1921 Oresteia was captioned ‘The Woman who Wasn’t’. W.A. Darlington of the Morning Post thought that no living tragic actress could compete with the Clytaemnestra of 1921 or the Electra of 1927, except Sibyl Thorndyke. An extraordinary thing about these productions was that for the first 30 years they had no director, at least according to the programme. You have to look at the list of the Committee, where you find one or more persons designated as ‘Stage Manager’. In several early productions, Stanford, who was himself a member of the Committee, also appears as ‘Trainer of the Chorus’, and for the Ion of 1890, Waldstein was billed as ‘Trainer of the Actors’. The first ‘Stage Manager’ was Waldstein, but he took second place to Willis Clark, after becoming Director of the Fitzwilliam Museum in 1883 and Slade Professor also two years later (still in his twenties). Clark was the life and soul of the enterprise in the 1890s, but in the new century H.J. Edwards and Walter Durnford took over. One has the impression however that there was not much overall direction. From 1921 onwards there was no doubt who was the Producer. For the next 30 years, the performances were the creation of J.T. Sheppard, (the Peithetairus of the 1903 Birds: right), helped by John Burnaby, the Trinity divine, who with self-effacing modesty, referred to himself only as his associate. Already in 1912, when Sheppard was associated with Durnford for the Oedipus Tyrannus, critics sensed a unity of idea underlying the whole production; and Gilbert Murray in a respectful, but not uncritical, account in the Cambridge Review, assumed that Sheppard was responsible. Now in 1921, at a time when Greek had just been abolished as a necessary qualification for anyone entering the university and was thought to be on the way out, he defiantly put on the Oresteia trilogy of Aeschylus, cut by a third but playing for nearly four hours in nine performances with a huge cast. Significantly, the aim of archaeological correctness in the costumes was now abandoned in favour for effectiveness, with Alec Penrose as the designer. Himself a born actor with a fine sense of the theatre, and a highly popular lecturer by sheer force of personality, Sheppard induced novices to take the stage. Once there, he told them what to do. ‘First you are a flame, then you are a lily’, was his instruction to Cassandra, recently Captain of the School at Eton. Blues were a useful advertisement. The curtain went up to reveal a familiar figure as the Watchman: G.S. Conway, the University’s rugger captain. In the 1933 revival, Hermes and Athena were both cricket blues (Athena bowled Bradman for 0 at Fenners and later became Secretary of the Appointments Board - J.G.W. Davies). But not all were novices. In the 1947 Frogs, J.D. Wilson, who gave an electrifying jazz performance with the castanets as the vulgar Muse of Euripides, had been premier danseur of the Melbourne Ballet before coming to Cambridge to read Chinese. Critics of the drier sort found Sheppard’s productions too romantic, indeed sentimental; but all were interesting and some were triumphant successes. The editor of the Spectator pronounced his 1936 Frogs ‘the best dramatic entertainment to be seen in England’. Arnold Bennett wrote of his 1921 Oresteia in the New Statesman: ‘He did not produce simply a drama; he produced an artistic ensemble: which is a rarity. The effect was colossal.’ It was in this production that George Rylands (Electra) and Donald Beves (Orestes) first appeared together. Their collaboration was to be for many years a feature of dramatic life in Cambridge, and Rylands was to produce several Greek Plays. Another extraordinary thing about the Cambridge Greek Plays was the prestige they long enjoyed. Locally one must remember, the ADC (Amateur Dramatic Club) founded in 1855, was for many years their only significant rival for student performances (although the Footlights Clubs was founded in 1883, and the Greek Play was one of the regular targets for their parody in the early days; Ion Revisited followed at the Theatre Royal in the week after the production of Ion in 1890) but the prestige was far more than local. For each of the four performances of the Ajax, a special train ran from King’s Cross and back. (Robert Browning was on one of them.) Reserved seats cost up to 10s. The opening night of the Birds was attended by Prince Albert Victor and the Postmaster General. Others who came included Lord Lytton, Lord Houghton, James Russell Lowell, and Alma Tadema. On each night of the Wasps of 1909, the menu in the Union dining room had a translation in Greek verse printed opposite. Composers of the stature of Stanford, Parry, Charles Wood and Vaughan Williams wrote music for the plays. When Wood received and honorary degree in 1894, the chorus of the Iphigenia in Tauris appeared wreathed in the gallery of the Senate House and sang one of his settings as he went up to the Chancellors. Even after the First World War, a half-hour film of scenes from the 1921 Oresteia drew crowds to the Victoria Cinema in May Week. Designers of costumes and scenery included well-known artists such as Alec Penrose, Duncan Grant and Gwen Raverat (who also made woodcuts for the programme of the 1933 Oresteia and postcards for the production). Press coverage also has been remarkable until recent times. The 1900 Agamemnon was accorded a special number of the Cambridge Review and a sumptuous illustrated souvenir number of the Granta. The 1921 Oresteia was noticed in 36 journals. The range sometimes extended to the less than national; thus the Blackburn Weekly Standard devoted two columns to the Birds of 1903, and the Frogs of 1936 were heard by the Golders Green Gazette. Occasionally it even transcended national boundaries. Le Journal des Débats in 1897, noting that the Wasps, although containing a few ‘plaisanteries un peu vives’, was most ‘pudique’ at Aristophanes’ comedies, concluding with a sigh: ‘A quand Lysistrate? A quand ‘L’assemblée des Femmes?’ and Le Figaro was eloquently complimentary to the Birds of 1903. Of course there have been contretemps of various kinds, but far fewer than one might expect. Jocasta on the first night of the 1887 Oedipus, endowed with a pair of broad masculine shoulders and a deep bass voice, further compromised reality by losing her wig at a critical moment. On the first night of the 1936 Frogs, the curtain went up at the beginning, instead of the end, of Walter Leigh’s overture (through which Dionysus and Xanthias tried to bay while the donkey cavorted incongruously). A more serious catastrophe threatened the 1933 Oresteia: when the rehearsals were well advanced, Clytaemnestra was converted to Moral Rearmament and conceived scruples about impersonating an immoral woman; but these were dispelled by Sheppard’s irresistible powers of peitho. The 1936 Frogs occasioned a different sort of religious crisis. Nugent Hicks, Bishop of Lincoln, had an exceptionally large head. In Cambridge to confirm some choristers at King’s, he tried on one of the frog’s heads prepared for the chorus and had great difficulty in getting it off in time for the service. It is astonishing how rarely winter has defeated the play. The 1947 freeze-up suddenly imposed daily power-cuts from 2 to 4 p.m. The matinées were hastily postponed to 4.30, but nearly all the school parties, from whatever distance, managed somehow to adjust their plans, and the scantily clad players braved the icy draughts of the barely heated theatre. Only once has ‘flu even threatened to stop the proceedings, though we have no understudies: Alan Ker sat gallantly with a temperature of 104 through the first performance of his 1959 Antigone, and the cast somehow survived the epidemic. Not a few of our performers have made names for themselves: in public life, for instance, Lord Runciman and his sons, Sir Ronald Storrs, Lord Trevelyan, Sir Andrew Cohen. A.C. Benson (‘rather soprano-voiced’) led the chorus of the inaugural Ajax. At a rehearsal of the 1906 Eumenides, it emerged that no one had been cast for the mute part of the Herald. Orestes (A.F. Scholfield) spotted someone among the onlookers and got him enrolled. Thus did the freshman Rupert Brooke make his début on the Cambridge scene. For a mute, he made quite impression: the Times said he was ‘exceedingly beautiful’, and the Granta, that he had ‘made many conquests in the audience, if rumour is to be believed.’ But the Cambridge Review spoiled the picture by complaining that he had had imposed on him ‘an ossified dignity which had kept the spectator on the verge of perpetual laughter.’ The 1909 Wasps featured two distinguished Trinity figures, the future economist Sir Dennis Robertson and the future historian Sir James Butler, as Philocleon the jury-mad Athenian, and the son who has to lock him up to restrain him - piquancy being added for the Cambridge audience by the knowledge that Butler’s father was in real life the venerable Master of Trinity. The film star James Mason recalled on Desert Island Discs that his first stage appearance was in the chorus of the 1930 Bacchae. A future London producer, Frank Birch, was Tiresias in the Oedipus Tyrannus of 1912. Another, John Barton of the Royal Shakespeare Company, played that part with memorable eerieness in 1949 in an ex-series production of Sheppard’s translation, the only production in English to have been sponsored by the Committee, with George Rylands as Oedipus. Looking back over more than a century of Cambridge Greek Plays, one has an unusual sense of continuity. The highest praise evoked by any actor before the First World War went to J.F. Crace, the Cassandra of the 1900 Agamemnon. 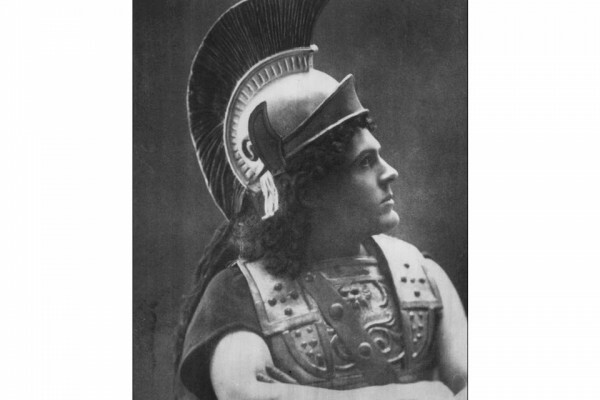 The highest praise ever went to one who had been a favourite pupil of ‘Janny’ Crace at Eton, Ronald Watkins: six-foot-five and clad in black from wig to toe, he dominated the Sophocles Electra of 1927, both by his speaking and by his acting. Fifty years later, now well known as a producer of Shakespeare in Elizabethan conditions, he returned to see and meet his successor, Kathryn Porter of Clare. As we approach the 2013 production, we continue to disprove the portentous words of the Daily Chronicle in 1890 that ‘Greek Plays are a fashion not likely to last’.